In this article we’re going to take a look at a wedding role for the tweens in your family, as junior bridesmaids! We dig into all the pressing questions that often come up such as dress matching, age range, and what exactly a junior bridesmaid is expected to do. First, let’s define the difference between a flower girl and a junior bridesmaid, because a lot of online brides seem to want to know. It is a common question that has a lot of varying answers depending on who you ask. The real difference is in age. Just how old is too old to be a flower girl? Or asked another way, how young is too young to be considered a junior bridesmaid? Like most things at a wedding, it depends! Our consensus view is that a cut-off age of around 10 or 11 years old is correct. Aged up to about 10 or 11 can still be considered a flower girl, and anything beyond that age can be considered a junior bridesmaid. Obviously it depends on the particular young girl’s maturity level and development. A 10 year old girl can sometimes be as tall in height as the bride — and act just as appropriately! 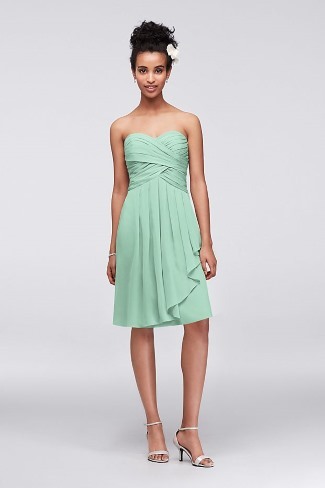 Jr Bridesmaid Dresses: Should they match Bridesmaids? A common misconception is that you must match both color and style. 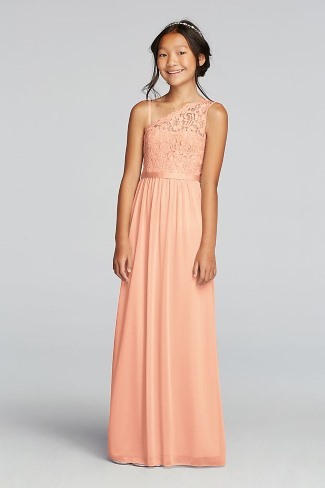 As a rule of thumb, the color of the junior bridesmaid dress should echo that of the bridesmaid dresses, while the style of dress can be uniquely its own. 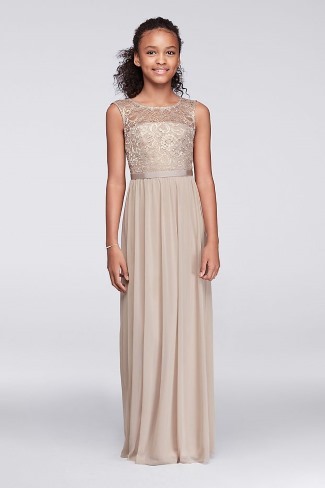 Most importantly, when choosing a dress for the junior bridesmaid, do be cognizant of her age. 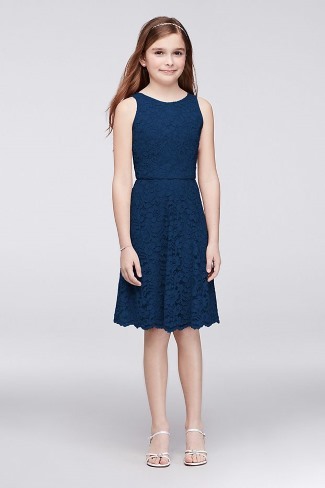 It is way cuter for a junior participant to wear an age appropriate dress, rather than a miniature bridesmaid dress that is too old in style. Showing as much skin as a maid of honor just doesn’t work. To give you an example, we like the visual below. 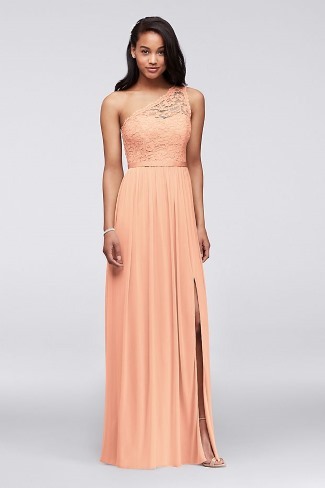 Choose dresses that are the same color and that have a similar cut. 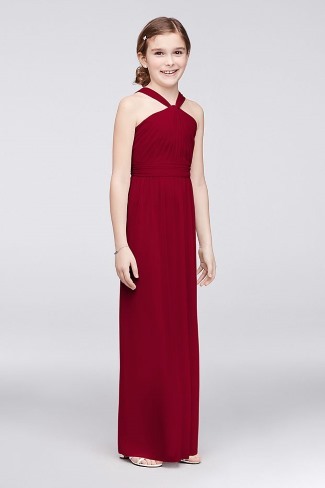 For example, choose strapless dresses for the bridesmaids, and then add that little element of the illusion neckline to the junior bridesmaid to keep the look cohesive and age appropriate. TIP: As a courtesy, it is a good idea to show the mother of the junior bridesmaid any dress style first to get approval before purchasing. Your idea of what is appropriate for an 11 year old might not be the same as the mother’s opinion. For those who read the top of this article, you’ll see that David’s Bridal has partnered with us for this post! 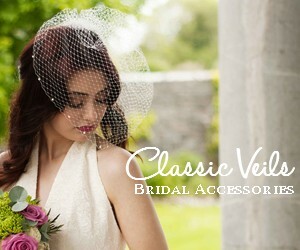 We’re fans of David’s Bridal and think they offer good value for wedding attire. In fact, Love & Lavender shopped David’s Bridal for both college graduation as well as parts of our own wedding day! 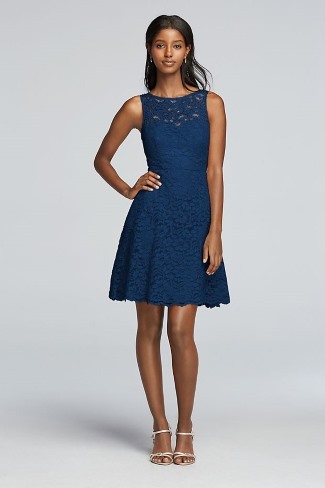 One thing we really like about their dresses for bridesmaids and junior bridesmaid is that no matter what size or style you are looking for, most of the dresses are available in multiple colors! This makes it so much easier to mix and match. What does a Junior Bridesmaid do? Alright, we gotta give you a bit more value for this post other than some cute dress options. 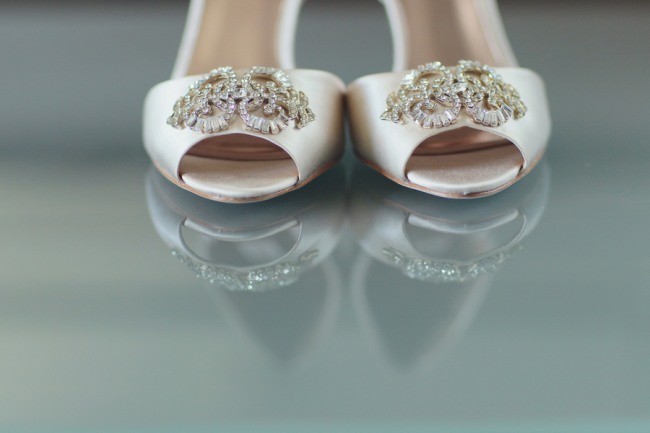 Although we think the above picks are super cute and would work for a lot of different wedding styles. Junior bridesmaids are not expected to give bridal showers, however, they should plan to attend any shower and help with cleanup, making favors, or other age appropriate activities. If you’re feeling up to a junior wedding gown shopping experience, take your junior bridesmaid for a dress consult and make a day out of it! Asking those you choose to be part of your bridal party is a big thing. Most brides and grooms want memorable ways to ask potential bridesmaids, groomsmen, a junior bridesmaid, and others to join their wedding crew. With younger bridal party members, you can really get creative and make it a fun surprise. After all, it is those memories that you will cherish most for years to come after your wedding day has passed. A cute handmade card is an obvious choice. Kids these days so rarely get real snail mail. It will be fun for her to get something unexpected from the postman. Take her dress shopping and then end up at the bridal salon as a surprise. Make a day out of it with lunch or even ‘afternoon tea’ as a real grown up treat. Although the role of junior bridesmaid is not necessarily an essential role for your wedding, you can still make your younger bridesmaid feel special and included. Speaking from experience, a niece or younger sister who is a junior bridesmaid will look back and remember your wedding day as one of the highlights of her youth. She’ll recollect in ways you’ve long forgotten, just how fabulous your wedding really was, and how she got to play a special role.